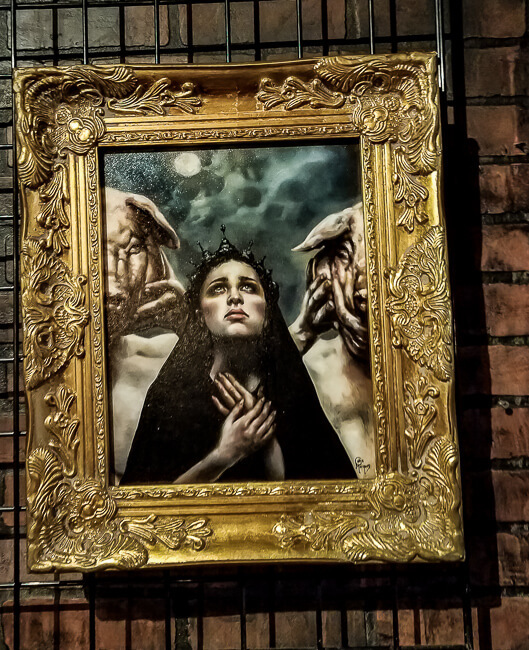 Thirty Six Black Art Collective is a tattoo and art gallery featuring an incredible collection of dark themed art, skulls, bones, unusual taxidermy, and all sorts of wonderfully disturbing items. There’s no place like it in Orlando or anywhere else. 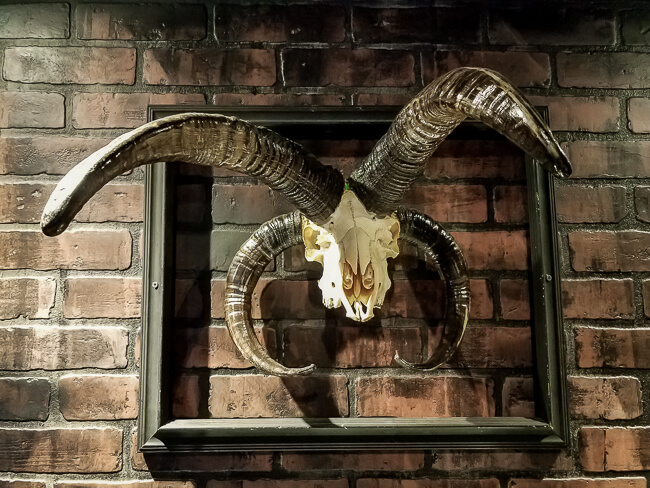 If you’re looking for an out of the ordinary experience and have an affinity for the macabre, Thirty Six Black is THE destination. We discovered Thirty Six Black completely by chance over the weekend. After eating at one of our favorite restaurants, my wife and I piled into the car and turned on the radio. As we headed toward the grocery store for our weekly shopping trip, one of their commercials aired and sparked my curiosity. After checking them out online and realizing they were just around the corner and on the way, we decided to drop by. As we were turning in, my gaze lowered from the signage to the storefront. I quickly noticed the front doors were propped wide open and in front of them sat a big hairy cool looking dog. Sitting next to the dog on the curb (almost camouflaged by body art) was this tatted up guy looking up at us through black tattooed eyes. Both the guy and the dog seemed calm and friendly enough not to murder us, so we approached, exchanged pleasantries, and we were welcomed inside. Turns out the guy with tatts up to his eyeballs is the owner, Johnny Nobody. He may look like an axe murderer, but he’s actually a super cool family man and artist with many unusual interests. He was really friendly and very interesting to talk to. As soon as I stepped the into the gallery, I knew we came to the right place. 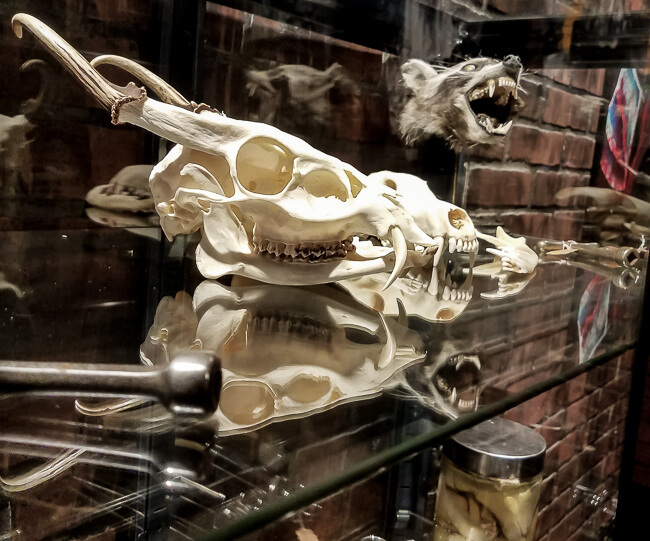 Hanging on the walls, arranged in cases, and organized on shelves were more than enough items and artwork to satisfy my morbid curiosity for hours. 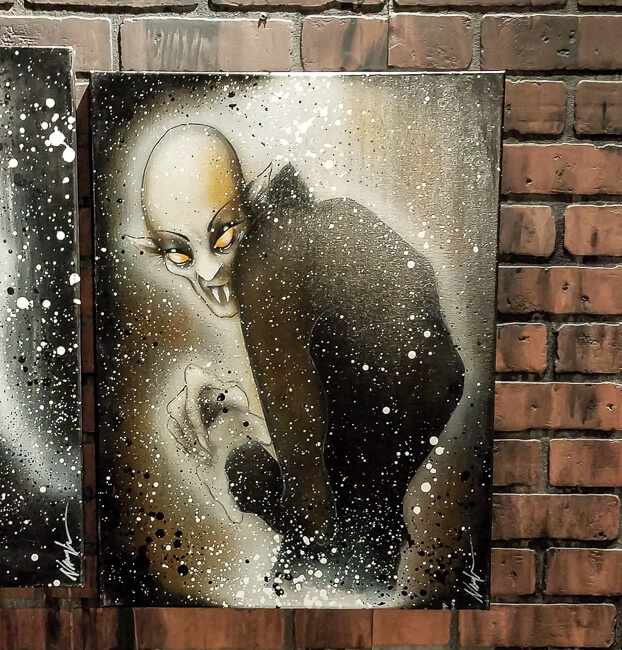 Thirty Six Black features incredible art created by artists both near and far. 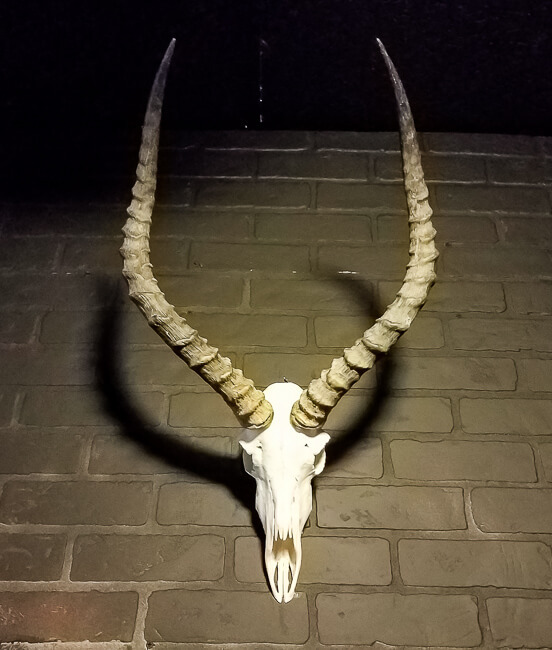 They’ve got everything from human skulls and skeletons, to horned animal skulls, weird taxidermy, fetuses, and much more. Thirty Six Black is also home to one of the most talented tattoo artists you could ever hope to find. 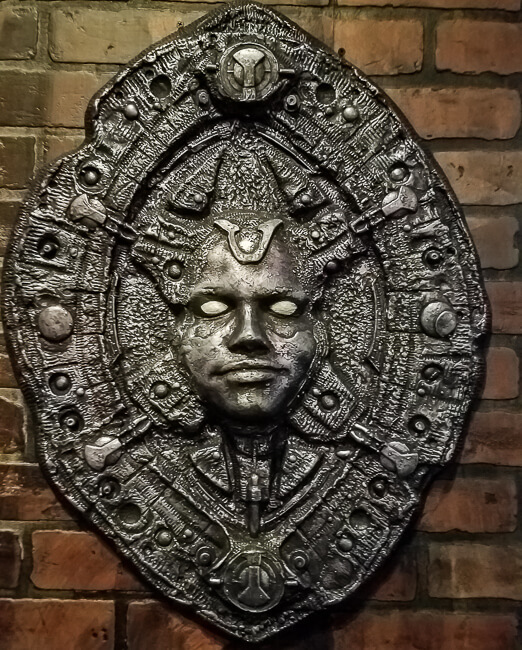 The guy is well traveled, highly talented, easy to communicate with, and has over 20 years of experience putting his creativity to work. One look at his portfolio or any of the other tattoo artists that work there, and you’ll never want to go anywhere else. 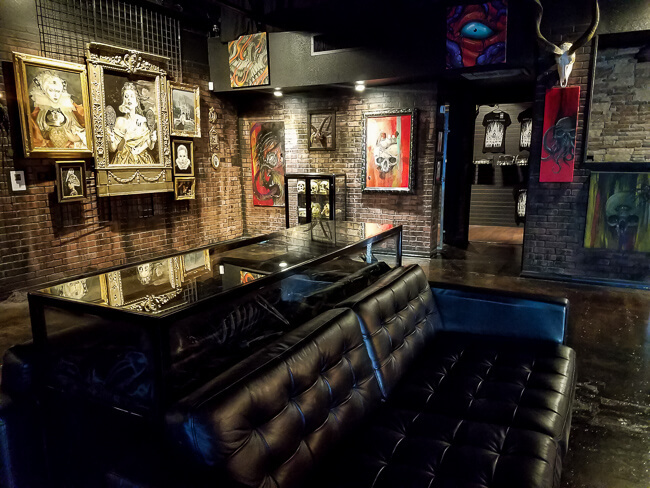 Thirty Six Black is the place you want to go for dark art and first class tattoos. Displays are rotated monthly to keep the art gallery fresh and exiting. I also hear there’s free beer on the second Friday of every month. Whether you are in the area or planning a trip to Orlando, be sure to stop by even just for a few minutes. They are open six days a week, see Thirty Six Black for details.